Posted byOpenArt January 16, 2019 January 16, 2019 Leave a comment on Shine Shivan’s solo, In-cult at Sakshi Gallery. 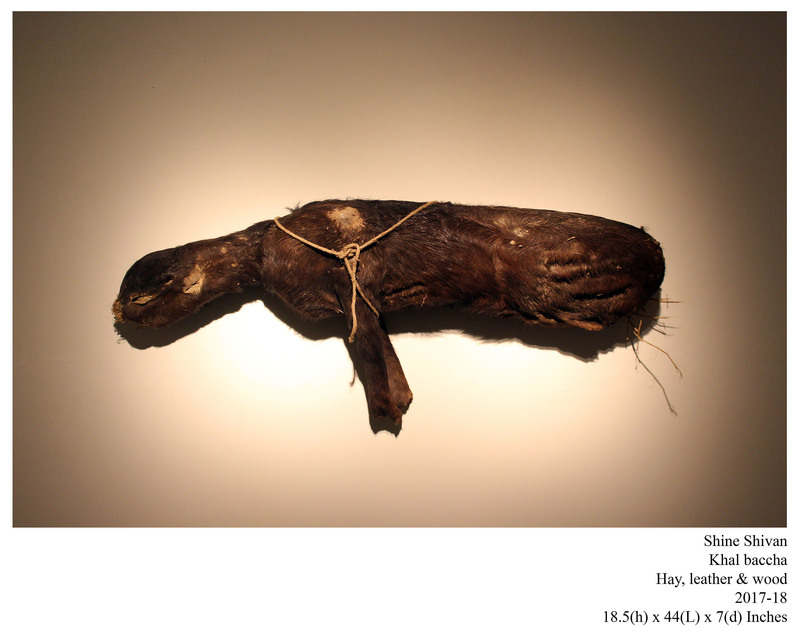 Sakshi Gallery is delighted to present ‘In-cult,’ an exhibition of installations and drawings by multimedia artist, Shine Shivan. The show previews on January 16 and marks Shivan’s return to Mumbai after a gap of four years. Shivan has, in the past, explored the limits of drawing, gender identity, and indeed life itself, through various disciplines, be it performance, video or multimedia sculptural installations. With ‘In-cult,’ he takes the exploration further, reflecting upon concepts from mythological stories and folklore to create works that reference incidents and events from his own life, making each piece a personal journey. Intrigued by stories of Lord Krishna, Shivan undertook a trip to the sacred Govardhan Mountain where he pondered over the sacredness contained within its 23 km circumference. He wondered if a part of this vast mountain would continue to hold the sacredness if removed from the site, and took home a small rock. 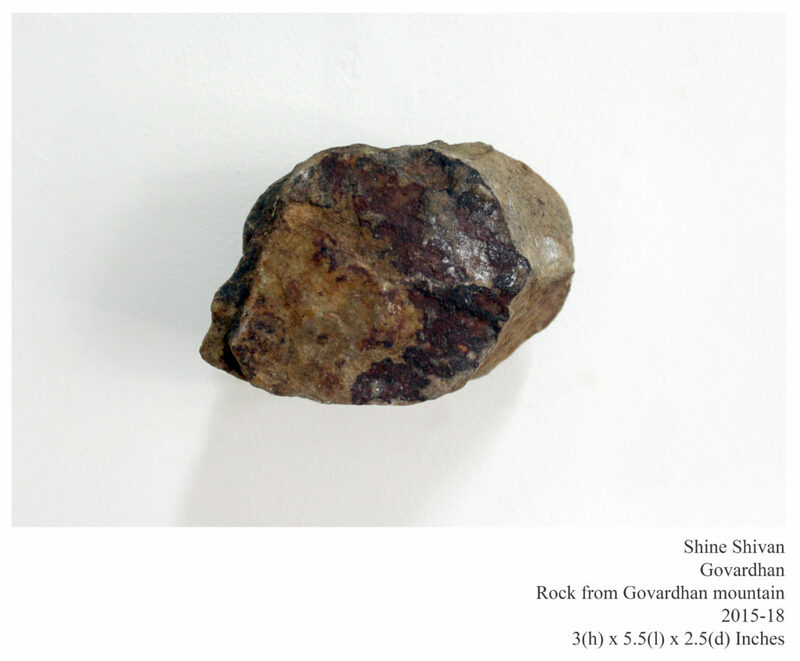 Now placing the same rock in a white cube, Shivan raises pertinent questions about parikrama – if devotees need to extend their circumambulation to the location of this rock so as to complete it in its absolute entirety. The exhibition also has him revisiting the sacredness of the cow as the earthly embodiment of Kamadhenu, as he reflects over the fact that despite being considered sacred, they are manipulated and exploited in many ways. Another poignant work has two carts belonging to the ironsmiths of Rajasthan, placed one on top of the other, much like the way chairs are stacked when not in use. Legend has it that the ironsmiths promised a king they would not settle in a place until he won against the mighty Mughals. Since the king never won the battle, they continue, till date, to lead an itinerant life. Such carts are their homes, the sum total of their existence as well as a symbol of masculinity. Beside the installations, are Shivan’s monumental drawings from the series Artha Yatra, which are delicate compositions that are complete in their incompleteness. 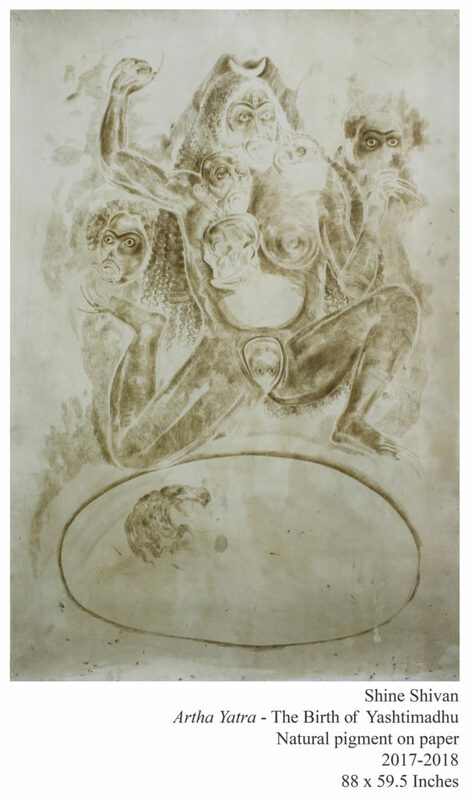 In these drawings, he revisits the theme of sexuality, which has been a recurrent motif in his practice. 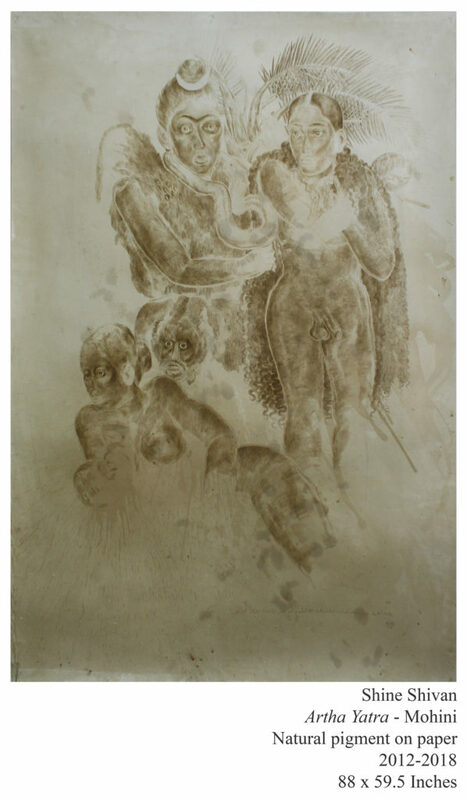 One of the drawings explores the narrative of Mohini, the only female avatar of Vishnu; and references Shiva, Parvati and their children, as Shivan muses on the changing dynamics between a husband and wife upon the birth of an offspring. Considered as a suite, the drawings depict a variety of experiences from the artist’s own life that find a resonance in myth and folk tales. ‘In-cult’ is a visual memoir that has Shivan retracing strong influences and interpreting them in his unique perspective. Through the show, he seeks to question and push existing limits, as he throws open new ways of seeing, and thereby introduces a new cult for the future. ‘In-cult’ is part of the Mumbai Gallery Weekend and will run through February 16, 2019. Shine Shivan was born in 1981 in Kerala. He has a Bachelor’s degree in Fine Arts from the College of Arts, Delhi and Master’s in Visual Arts from Dr. Bhim Rao Ambedkar University, Agra, India. His work has been exhibited extensively across the world including the Tate Modern, London, UK; MOCA Taipei, Taiwan; Prague Biennale 5; and Kastrupgårdsamlingen, Copenhagen, Denmark. He lives and works in Faridabad, India.